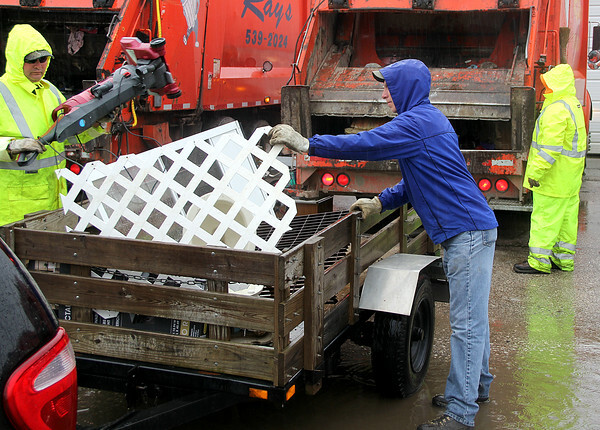 GOTTA GO: Lebanon resident Bob Trafford (center) helps Craig Hurst (left) unload a trailer full of trash at the Lebanon Street Department on Saturday. It was the first of two Heavy Trash Days sponsored by the Street Dept. "I always put this on my calendar for both the spring and fall," Trafford said. "It's an excellent service for the community. It's like a holiday." Street Dept. workers all said despite the rain, it was very busy.